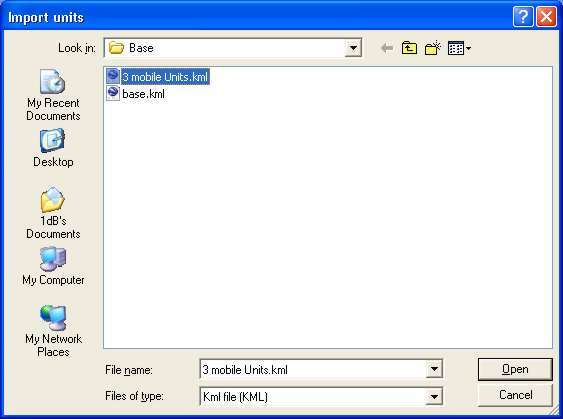 Units may be exported from a Network and be saved as a Text file or a .kml file. 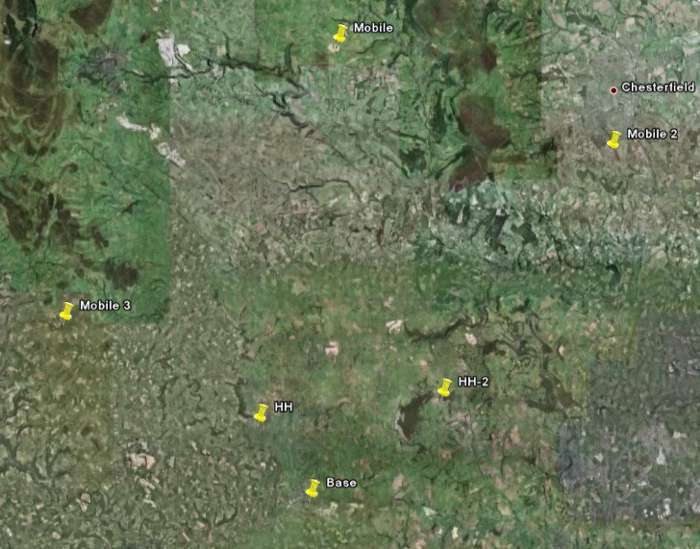 The .kml file is capable of being Imported into Google Earth to be shown as named 'place marks' at the Unit locations. 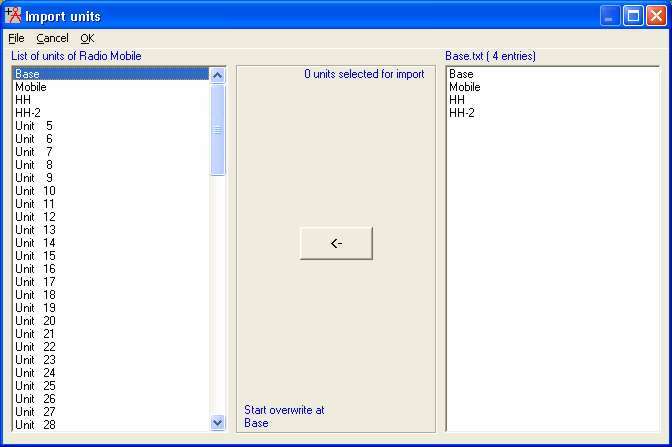 Similarly a Text file can be opened, and selected Units imported into a network. 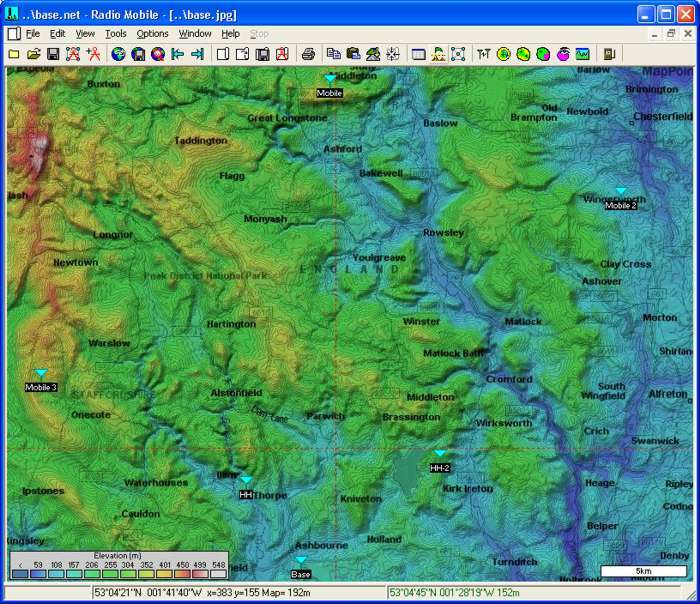 It is now possible to import selected Units from a .kml file generated in Google Earth. This last capability allows 'place marks' to be located and placed accurately on the Google Earth aerial photographs, named, saved and then imported directly into Radio Mobile as Unit locations. This picture from Google Earth shows the required locations of three mobile Units in my Base map area. Using 'File/save place as', the 'place marks' were saved as '3 mobile Units.klm'. Make sure that after locating all the 'Place marks' (which are placed in Google Earth's 'Temporary Places' folder), that you highlight this folder in the control area before 'save place as' is invoked, otherwise only the last 'Place mark' generated will be saved. Which when opened shows all the locations and Units from the .klm file. Selecting the first Mobile Unit, it has been overwritten, followed by 'Mobile 2' and 'Mobile 3' which have overwritten the unused Units 5 and 6. The Units are now placed at their required locations, but they have to have a Radio Operating System allocated to each of them before they can be utilised in a Network. 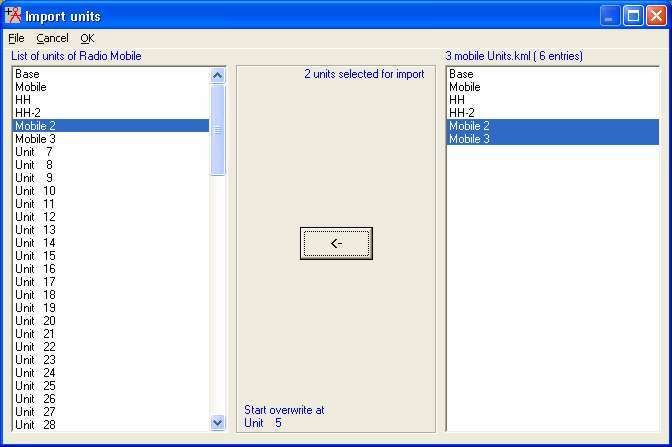 Opening 'File/Network Properties' to access the pane below, shows that the Mobile Units have been given a Subordinate Role and allocated to the 'Mobile' System settings. But don't forget that Units have to be enabled in both Network Properties and Unit Properties to show up in a Network. 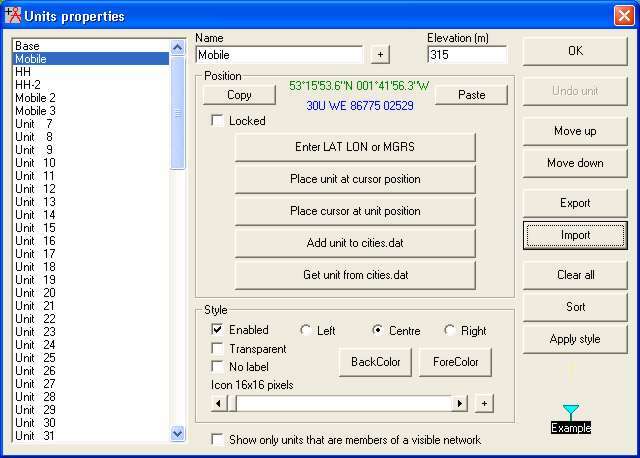 1) Where a single Unit Name and Location are required to be imported into Radio Mobile, an alternative method is to 'Right click' on a Google Earth 'Place mark' and select 'Copy' to place its data onto the clipboard. If then the Unit Properties pane seen above is opened in Radio Mobile, and an unused Unit selected with a Left Click, a click on the Position 'Paste' button will enter the name and Location of the place mark. As above, a Radio Operating System will have to be allocated to the Unit in the Network Properties pane, and the Unit enabled to make it active. 2) An existing Network may be modified by using the 'Clear all' button to remove all its existing Units - then importing new Units from a text or kml file. This procedure has the advantage of retaining the Systems and Parameters of the Network to be utilised in the new network, but all Units have to be allocated an Operating 'System' before they can be used. Don't forget to save the new network under another name, or the original one will be overwritten. 3) Starting with 'File/New Network', will clear all information from memory and produce a blank Radio Mobile pane without a map. Opening 'Unit Properties' will then enable you to import Units as above. Next, open 'Edit/Fit map to Units' which produces the Map Properties pane where the actual size of the map in pixels can be selected, followed by 'Extract'. This will produce an elevation map covering the Unit area and display the Units. 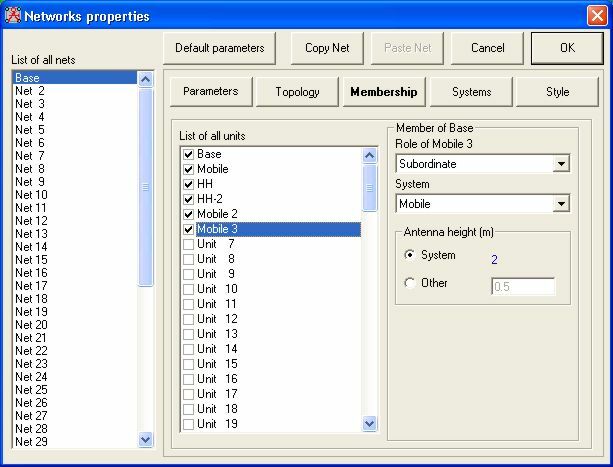 The 'Network Properties' pane will then have to be accessed to select the required Radio Network Parameters, Frequencies and Systems to be used, then allocate the Units to their required Systems.